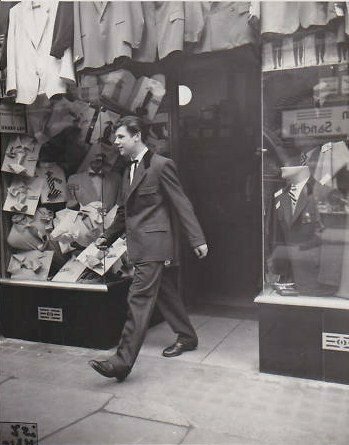 Life of Teddy Boys in Notting Hill in 1955 prior to the so-called 1958 Riots is described and also recalled by former Teddy Boy and local historian, Eddie Adams. As Britain emerged from post-war austerity, working class youths found themselves no longer categorised as older children or young adults but as a new economic class - the teenager. 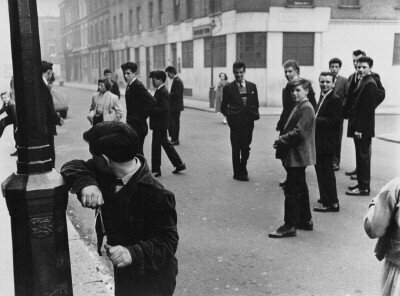 The first British manifestation of youth culture, the Teddy boy, evolved from the wartime blackmarket spiv as a mixture of upper-class Edwardian and Wild West styles. The look,is thought to have originated in south London around Elephant and Castle in the early 50s, consisted of a quiff with greased back DA (duck's arse) hairstyle, drape coat with velvet collar, bootlace tie, drainpipe trousers, and brothel-creeper shoes. In 1954, as the term 'rock 'n' roll' was first popularised by the DJ Alan Freed, the Home Secretary was already playing down reports of widespread Teddy boy delinquency. The Teds' revolt into style was summed up by George Melly as an economic development from the spivs; in that 'they were not criminal in the old sense. They were not out for gain. On the whole, though, they were profoundly anti-social: the dark van of pop culture, dedicated to the giggle and kicks.' Julien Temple, the director of Absolute Beginners and The Great Rock'n'Roll Swindle, eulogised the Teds in NME as "the heirs to the spivs .... an epic breed.... Byronic in their scope. Most of all they frightened the establishment. They were much bigger and more dissenting than rock'n'roll. They are a part of the despair of Britain after the hopes of the end of the war .... They're like something out of the Wild West, they were villains, but really they were epic in that context." In the mid 50s, youth culture was first defined in Hollywood by Marlon Brando in The Wild One and James Dean in 'Rebel Without a Cause' as the archetypal teenager. Over here, 'Rock Around The Clock' by Bill Haley and his Comets caused cinema riots and rock 'n' roll moral panic. The single entered the British chart in 1955 and reached number 1 as it appeared in the juvenile delinquent film 'Blackboard Jungle,' starring Sidney Poitier and Glenn Ford. The release of the Rock Around the Clock film the following year was accompanied by rock 'n' roll riots in several countries and Teddy boy media hysteria. In The Fifties book Peter Lewis called it a 'Youthquake'. At a typical Bill Haley cinema riot, Teds were reported jiving in the aisles, chanting 'We want Bill!' and 'Rock! Rock! Rock!' The local teenage rampage took place in the Prince of Wales Cinema on Harrow Road. In 1957 Bill Haley was greeted by thousands of fans when he arrived for the first Rock 'n' Roll tour of Britain. 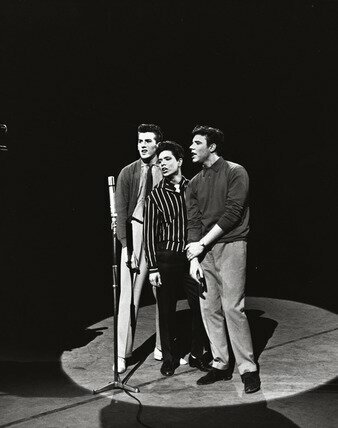 'Rock Around The Clock' spent a total of 20 weeks in the chart to become the UK's first million-selling record, and the Bill Haley lyric, 'See you later, alligator, in a while, crocodile', was popular with Princess Margaret's set. But the ageing Haley was soon surpassed by Elvis Presley as the Ted role model for youth rebellion. The mid to late 50s Elvis hits - 'Heartbreak Hotel', 'Blue Suede Shoes', 'Hound Dog', 'Rip It Up', 'All Shook Up', 'Teddy Bear', 'Jailhouse Rock', 'King Creole' - inspired the shift in British pop culture from skiffle to rock'n'roll. In Elvis's wake such homegrown teen idols emerged as Adam Faith, Billy Fury, Cliff Richard, Tommy Steele and Marty Wilde. As the Teds progressed from smashing up cinemas to harassing Cypriot and West Indian immigrants, the look caught on in Notting Hill. The prime local pose locations, featured in The Street Photographs of Roger Mayne, were Southam Street in Kensal and Portland Road in Notting Dale. At the same time the future film director Ken Russell, then a local art student, photographed 'Bombsite Boadicea' Teddy Girls with headscarves instead of quiffs. "The best times for the shop were the 50s. All the fellows wanted a hand-made suit, mostly West Indians and we worked a lot with the Teddy boys. 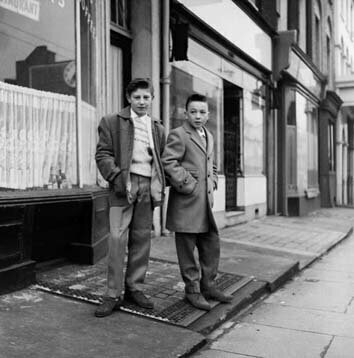 At that time Teddy boys used to be well-dressed." "There was a lot of small gangs and fighting among kids, never anything too serious but it was a bit heavy at times. The gang I was in was the Moorhouse boys. Our gang philosophy was to have the latest suits. 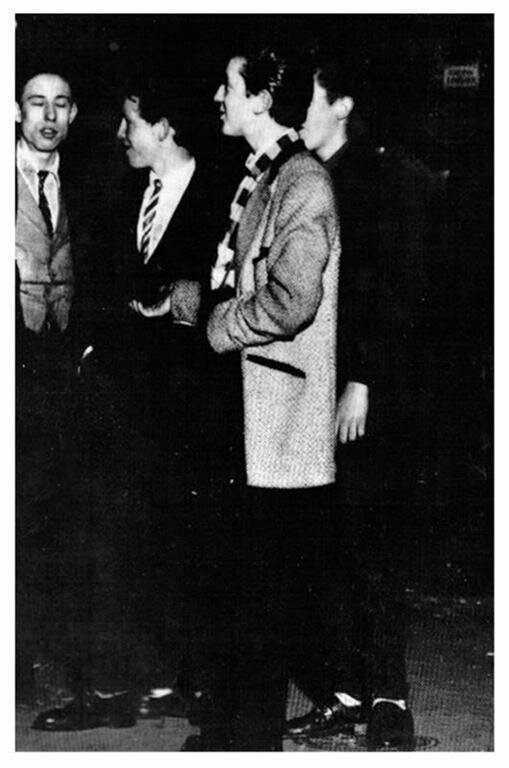 We were basically Teddy boys with drainpipe trousers and 4 button suits. I used to go to Manny Marks in Praed Street to have my suits made. You could have any design but generally speaking it was like a Teddy boy with long jacket, 4 buttons, narrow trousers. I can remember having a dark blue one with herring bone material. Some people had a bit of velvet on the collar. Suits cost between £30 and £40, they were quite expensive and it used to take about 6 weeks before you got the suit. We used to wear bootlace ties, suede shoes with crepe soles, my blue suede shoes, quite a lot of hair and we used to bring it round the back in a DA. We used to wear a lot of Brylcream and had quiffs"
"We used to go to the British Oak pub in Westbourne Park Road, at that time very much an Irish pub, all types of drinking clubs and later coffee bars - the Two Bare Feet in Westbourne Grove, the Green Door drinking club on Hereford Road, dances at Hammersmith Palais and Porchester Hall - jiving. If you went out of your area into another area, such as the Harrow Road, you were likely to bump into the Harrow Road boys and they were likely to chase you off their turf, so to speak. If there was a fight it would mainly be fists, later on somebody might pull a knife or something like that - generally speaking there was a lot of threatening rather than action. I got involved a few times.... Some people had flick knives, I didn't." "If you were a Teddy boy what you aspired to was a 40 guinea suit. You'd see fellas in pubs - the favourite pub where it used to occur was the Elgin, because you had a fella used to sing on the stage there, Welshman called Johnny Fredericks, had a very fine tenor voice but he'd sing pop songs - they'd all be lounging around the Elgin, which was a smart place to go then, and all be kind of weighing up each other's sartorial elegance. You know, how much did that suit cost? That's a 25 guinea one, I've got a 45 guinea one." 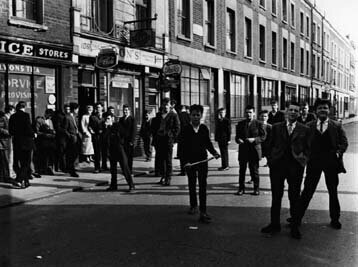 "People who used pubs were of an older generation, rock 'n' roll hadn't kicked in yet, the Teddy boys were still going to coffeebars or to the West End. Entertainment in the pubs, it wouldn't be guitars, it would be piano and drums. In the case of the Latimer (Arms on the corner of Latimer Road and Walmer Road) they couldn't afford drums sothey had Danny McDermott playing on a hard-seated chair with a couple of beerbottles, and that would be the rhythm section. People would do Nat King Cole turns, a few of them, and the main one was Al Jolson. In the Elgin, or as we called it the El Gin, old Reggie Jones used to do his Jolson act and they had talent competitions. It was old style singing, no guitars, it was jazz orientated or popular song based, more like Sinatra and Nat King Cole, going back a bit further, Al Jolson".